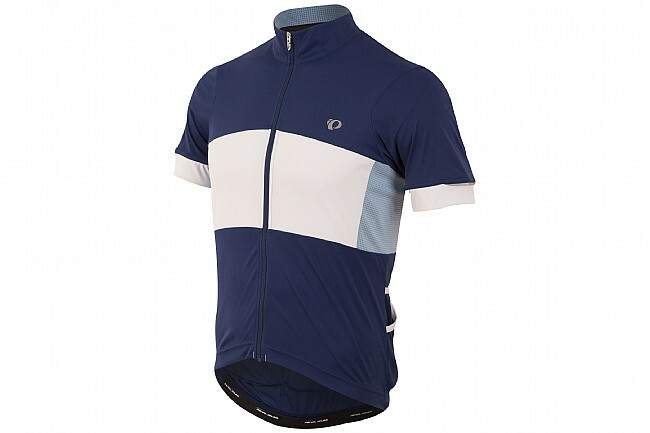 The Pearl Izumi Men's Elite Escape Semi-Form Jersey is ideally suited for larger riders or those who prefer a roomier cut. Not everyone has the physique of a pro racer or finds the snug to skin tight apparel prevalent in cycling to be comfortable, and Pearl Izumi recognizes this. To address this they offer their Elite Escape Semi-Form Jersey which delivers the same performance fabrics and technologies as their other Elite jerseys but with a roomier cut. The Transfer In-R-Cool® fabric provides excellent breathability and the inclusion of Ice-Fil® technology further improves skin cooling. To further aid in temperature regulation, this jersey also has Direct-Vent panels for strategic venting. Additional touches like a full-length zipper, reflective elements, and three standard rear pockets with two additional side pockets make this Elite Escape Jersey sure to be a new closet standard for those preferring a larger cut jersey. Available in multiple colors. Features reflective elements for increased visibility in low light. con be trying. Pearl Izumi is a brand that addresses this issue and I'm very happy with the fit and durability of their products. This jersey is made with a very soft and comfortable material. It appears well made with a good zipper, good pockets and doesn't use elastic at the arms or waist. The fit is not too tight, but not at all flappy and it looks good without being flashy.